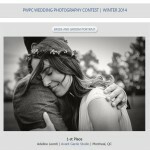 PWPC Winter Photo Contest’s results are live now. Two of my pictures are placed in this round: 1st place/Bride and Groom category and 8-th place/Ceremony category. Many, many thanks to Laura&Samuel and Mina&Maggie!! !